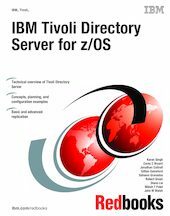 This IBM® Redbooks® publication examines the IBM Tivoli® Directory Server for z/OS®. IBM Tivoli Directory Server is a powerful Lightweight Directory Access Protocol (LDAP) infrastructure that provides a foundation for deploying comprehensive identity management applications and advanced software architectures. This publication provides an introduction to the IBM Tivoli Directory Server for z/OS that provides a brief summary of its features and a examination of the possible deployment topologies. It discusses planning a deployment of IBM Tivoli Directory Server for z/OS, which includes prerequisites, planning considerations, and data stores, and provides a brief overview of the configuration process. Additional chapters provide a detailed discussion of the IBM Tivoli Directory Server for z/OS architecture that examines the supported back ends, discusses in what scenarios they are best used, and provides usage examples for each back end. The discussion of schemas breaks down the schema and provides guidance on extending it. A broad discussion of authentication, authorization, and security examines the various access protections, bind mechanisms, and transport security available with IBM Tivoli Directory Server for z/OS. This chapter also provides an examination of the new Password Policy feature. Basic and advanced replication topologies are also covered. A discussion on plug-ins provides details on the various types of plug-ins, the plug-in architecture, and creating a plug-in, and provides an example plug-in. Integration of IBM Tivoli Directory Server for z/OS into the IBM Workload Manager environment is also covered. This publication also provides detailed information about the configuration of IBM Tivoli Directory Server for z/OS. It discusses deploying IBM Tivoli Directory Server for z/OS on a single system, with examples of configuring the available back ends. Configuration examples are also provided for deploying the server in a Sysplex, and for both basic and advanced replication topologies. Finally it provides guidance on monitoring and debugging IBM Tivoli Directory Server for z/OS.